Crane operators and other union members walked off the job on Aug. 21, and after a brief negotiating session Monday, no further talks are scheduled, according to the union. 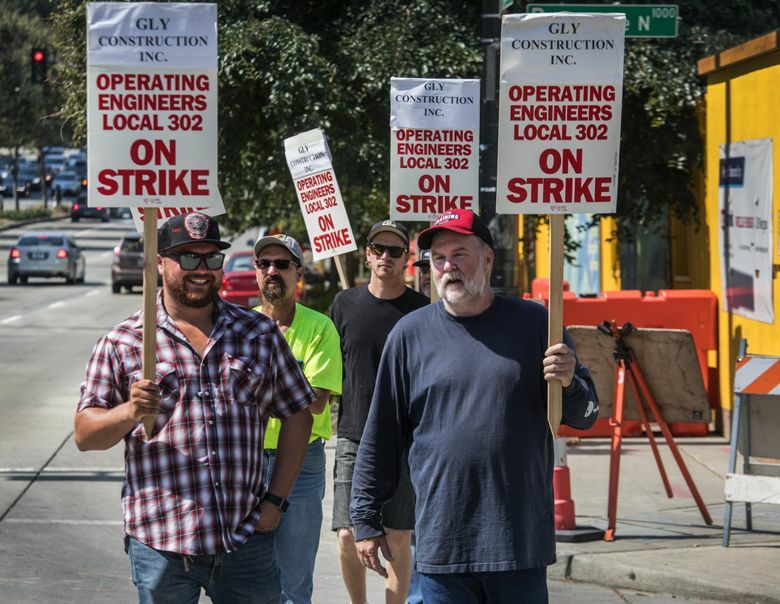 The construction worker strike that has slowed or halted projects across Western Washington entered its second week Tuesday, with no apparent movement between the union and management. The International Union of Operating Engineers Local 302, which includes crane operators, surveyors, road pavers, mechanics and other workers, walked off the job Aug. 21. Its members had twice voted down tentative deals after their contract expired in June. The union said it met Monday with the Associated General Contractors of Washington, which represents most contractors in the area, for the first bargaining session since the strike. “The meeting was short because the Employers’ position has not changed from their last proposal,” the union said in a notice on its website. The contractors group did not respond to a request for comment. The walkout has shut down or slowed dozens of developments west of the Cascades, ranging from Amazon offices and apartment high-rises in Seattle, to street widening near Microsoft in Redmond, to road repaving in Snohomish. During the strike, the cacophony of noise that has become a soundtrack to Seattle – the constant jackhammering, the heavy trucks beeping, and the workers yelling to one another – has gone mostly quiet. Much of the work at job sites can’t be done without crane operators and the other workers covered in the union contract, and some employees belonging to other unions have stayed off the job in solidarity. The sight of cranes sitting stationary, in particular, was quite the change: Seattle has 65 cranes, the most in the country, while Bellevue has another 14, but virtually all of them have been unused during the work stoppage. The exact sticking points remain unclear in the negotiations for a master labor agreement that covers the operating engineers’ work across all of Western Washington. Neither the union nor the management have agreed to discuss the negotiations over the past week. The contractors group, meanwhile, has said only that it was “disappointed” by the walkout and that it would continue to work with the union in hopes of reaching a deal. Members of the union now make $37.70 to $43.13 an hour, after a 6 percent pay bump over their prior three-year contract. Under the most recent proposal, rejected by union members earlier this month, the workers over three years would get a 15.9 percent pay raise and a 13 percent increase in fringe benefits such as health and welfare and pension pay. That was a slight increase from the offer that union members rejected in July. Both sides face a delicate calculus during the work stoppage; every day that goes by without a deal costs everyone involved more money. For developers, delays mean added costs, while workers face more days without a paycheck. In some cases, however, overtime can help make up for the lost progress and missed paychecks. Workers picketing at least 20 hours a week are also eligible for up to $400 a week in strike pay starting this week. Local construction strikes have varied in length. Last year, concrete drivers walked off the job, slowing development, but reached a deal a week later. In 2016, window installers went on strike for about three weeks. In 2003, a local carpenters union struck for 9 days. Striking workers have picketed at three Washington State Department of Transportation worksites – on Interstate 90 near Snoqualmie Pass, at the junction of I-405 and state Route 167 in Renton and on U.S. 12 in southern Washington, the agency said. Scheduled work last weekend on 405 and at the southern portal of the new Highway 99 Tunnel in Seattle was also scrapped because of the strike. In Bellevue, the lack of heavy equipment and crane operators has shut down some sites completely, while some are still able to do interior finish and other light work, said Steph Collier, a spokeswoman for the city’s development services. The projects range from private developments like housing and offices to public projects such as schools, she said. Staff writer David Gutman contributed to this report.